These Party Balloons are an easy and fun craft to help celebrate New Years Eve, American Holidays, or any celebration, just change the color of the balloons to match your holiday! 1. Insert the funnel into the end of the balloon. 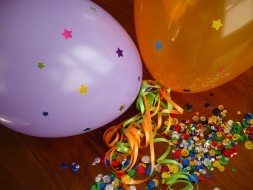 Fill your balloon with confetti, small sparkly sequins or holes from the hole punch. 2. Blow up your balloons. We added some extra fun by decorating our balloons with stickers.